BMW's 4 Series Coupe has proved to be quite a success story for the Munich marque, accounting for around 25% of sales in the 4 Series model range, a line-up that has shifted over 400,000 units since its original introduction in 2013. Now, there's a significantly revised version of this two-door model. Now that we're quite used to BMW's 4 Series Coupe, it's a little difficult to remember quite what a stir it caused at its original launch here in 2013. Since then, we've seen further Convertible and four-door 'Gran Coupe' versions of this car, but this Coupe version is arguably the purest interpretation of what still is a very pretty shape. Since this Munich model was first launched, the opposition has considerably upped its game, with new generation versions of both the Mercedes C-Class Coupe and the Audi A5 Coupe both threatening BMW's market share in this segment. Hence the need for this revised two-door 4 Series. So is this something other than simply a different alternative to an A5 or a smarter 'C'? Munich says so. Sleeker and sharp-looking, the aim here is to offer more than just a love letter to performance but instead, the promise of a passionate affair. Dynamic changes made to this improved model mean stiffer suspension and an upgraded steering set-up. These measures have resulted in a tangible improvement in both lateral and longitudinal handling properties, regardless of the load on board. The upshot is reduced roll, more neutral responses when driving at the limit, even greater straight-line stability and the wonderfully precise steering for which BMW is renowned. This applies to the standard suspension, as well as the M Sport suspension and Adaptive suspension. As ever, the oily bits are, somewhat predictably, shared with the 3 Series, as it would be cost prohibitive to do anything otherwise. The biggest seller continues to be the 190bhp turbocharged 2.0-litre diesel in the 420d variant, with comes with either two or four wheel drive. Above that come the six cylinder diesel models. There are rear wheel drive and xDrive 4WD versions of the 258bhp 430d, before you get to the 435d xDrive diesel range-topper with a hefty 313bhp at its disposal. In the petrol line-up, things kick off with the base four cylinder 184bhp 2.0-litre unit found in the 420i, which is slightly more efficient than it used to be and, as before, comes in rear wheel drive and xDrive 4WD guises. The pokier version of this powerplant these days carries a '430i' badge and has a 252bhp output, with torque rated at 350Nm, making possible a rest to 62mph ime of just 5.9s. That makes it difficult to imagine why you'd want a six cylinder petrol model, but if you still do, there's a 326bhp '440i' variant. Remaining at the top of the range is the twin turbo six cylinder 431bhp M4 super-coupe. The changes made to this revised 4 Series Coupe are really quite subtle. If you know the car well, you'll spot the new twin LED headlights that now come as standard. An even more distinctive 'Icon Adaptive LED headlight' package is optional. Another frontal change is found in the central air intake which has an aperture that increases in size towards the outer edges, adding a more imposing presence and greater sense of width to the entire nose section. Otherwise, this model has all the predictable BMW coupe design elements we've seen so often over the years - the short overhangs, the long bonnet, the set-back passenger compartment, the shallow frameless side windows leading into the signature Hofmeister kink on each C-pillar and a flowing roofline that offers up a low, stretched silhouette. Take a seat inside and the cabin holds no great surprises if you're familiar with BMW's current design language. A few detail changes have been made with extra splashes of chrome here and there but otherwise, not much as changed. You sit lower than you would in a 3 Series, but you're not going to need re-training when it comes to operating the dash controls or the infotainment system. There's a robotised arm for the front seat belts and the door cards and seats are 4 Series-specific. The rear retains individual seats with a divider down the middle, which means the 4 Series is a strict four-seater. There's a 445-litre boot. 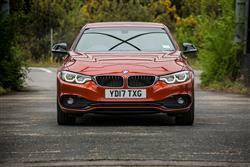 Prices start at around £32,500 for the Coupe version of the 4 Series. The entry-level variant gets leather heated seats, xenon headlamps, LED rear lights and a parking radar, as well as climate control. Satellite navigation is standard, but the adaptive dampers are a box you might want to tick on the options list as well as the sport steering. We could take or leave the sports seats, but the stereo upgrade is worth giving a listening to. BMW will also tempt you with a range of connected services, a head-up display, and some neat driver aids but you'll need to keep an eye on the asking price. Don't go spending too much on aesthetic options until you've considered the merits of BMW's various ConnectedDrive media packages. These include the latest BMW Professional Navigation system with its smarter iDrive touch controller which can offer a pad for writing text or using a cursor on an interactive map. The Navigation set-up can also divert you around jams with Real Time Traffic Information and BMW Online services. There are also infotainment features like full speech recognition and voice control with an optional message dictation function. Plus there's web radio, access to social networking, and the Google Send-to-Car system so you can plan your route beforehand on your PC, then remotely forward it to your car. You'll have access to various BMW apps too, including my favourite one, a free remote app that enables you to remotely lock or unlock your car if you lose your keys. The 4 Series may be predictably pricey to buy but it's surprisingly affordable to run. BMW's EfficientDynamics technology is standard across the range, helping the cars achieve economy and emissions levels that belie the kind of performance that's on offer. The latest car looks a very strong contender with ultra-competitive economy and emissions figures right across the board and it's hard to be unimpressed by the 430i, a petrol-engined performance coupe that can dip under six seconds to 62mph, yet still returns a fuel economy figure of 46.3mpg and emissions of just 151g/km. With the 420i, those figures improve to 48.7mpg and 134g/km, while the pokier 420d can very nearly duplicate those figures. Even the top xDrive 4WD 435d variant manages 50.4mpg and 147g/km. What else? Well there's a condition-based service indicator and those maintenance costs can be kept in check with two optional Servicing packages which cover you for servicing - or servicing and maintenance - for five years or 50,000 miles. Finally, there are strong residuals: to be more specific, expert predictions suggest that on a 420d variant, you should get 41.5% of your purchase price back after three years, which means this BMW could be worth up to £4,000 more than comparable rivals at that point. So is this BMW 4 Series still the coupe that does it all, the class benchmark, the go-to choice in its segment? The answer's probably yes. Overall, there's a sustained level of excellence shot throughout this car that Audi A5 and Mercedes C-Class Coupe rivals can't quite match, something especially evident when it comes to handling dynamics. There's a levity about this 4 Series, a certain joy you get in driving it that the others can't quite match. Great then, that it does all the sensible stuff really well too. You get impressive safety systems, a big boot, plenty of rear legroom, excellent day to day running costs and residual values that are markedly superior to this model's two key rivals. Which all helps your conscience. Why? Because this is a car that, exactly because of those attributes, you can buy and use - and use hard - without that nagging sense of guilt that you may have over-indulged yourself. In short, you'd like one.